The Travis was invented by Byron Brooks and was originally to be produced by the Moto-Cycle Company of Philadelphia. That company never came off the ground and production was finally taken up by the Philadelphia Typewriter Company, owned by a successful Remington agent called William Travis. Brooks sold the patents for this machine to Travis and went on to work on the machine that bore his own name. The PTC built the machine and put it on the market locally. 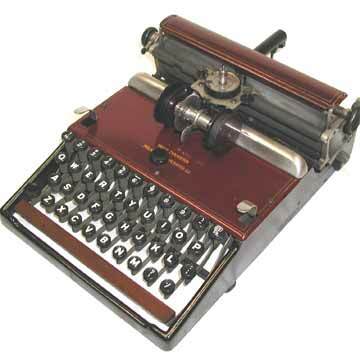 Very few Travis Typewriters were produced. The machine is extremely rare today. The Travis featured a four-row keyboard and a horizontally placed typewheel. The paper was struck by a hammer from behind and pressed against the typewheel, much like the Chicago and Hammond. The paper had to be rolled into a cylinder under the hammer. For more details see the book â€œTypewriterâ€�, page 115.